Click here to download a translated version in German. StorMagic SvSAN is a virtual SAN – a software defined solution designed to run on two or more servers and deliver highly available shared storage. SvSAN simplifies your IT infrastructure. It eliminates the need for a physical SAN, enabling hyperconvergence by virtualizing the internal compute and storage of any x86 server and presenting it via a hypervisor as shared storage. 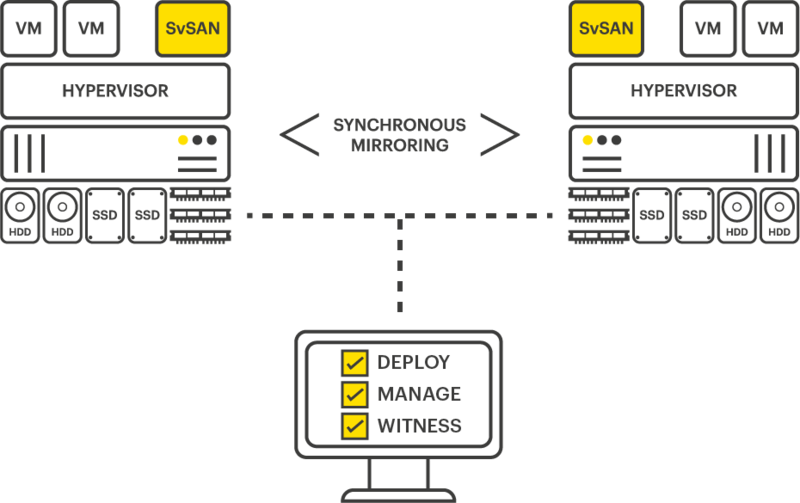 A typical two-node SvSAN configuration, with a centralized management interface and witness, is shown below. This data sheet is broken down into four sections, covering SvSAN’s features, its requirements, hardware and software compatibility and finally support levels. For a greater technical examination of StorMagic SvSAN, including deployment options and use cases, please refer to the SvSAN Technical Overview white paper. StorMagic SvSAN has a range of features enabling the storage architect to get the most out of their infrastructure. These features are detailed in the table overleaf. There are two versions of SvSAN available, Standard Edition and Advanced Edition. The Standard Edition provides all of the features necessary to deliver highly available shared storage, while the Advanced Edition includes additional features such as Data Encryption and performance-enhancing Predictive Storage Caching. Many of these features are covered in more detail within their own white papers. View the full range on the StorMagic website. StorMagic SvSAN is licensed based on the usable VSA storage capacity. License tiers are set at 2TB, 6TB, 12TB and Unlimited TB. SvSAN licenses are perpetual – after a single payment they can be used forever. Ongoing costs concern only support renewal payments. Pricing is based on a two node license bundle, with one license key per server. Single licenses are also available however. A free, fully functional evaluation of SvSAN is available to download, enabling organizations to trial and experience the features and benefits of SvSAN, before purchasing. NOTE: The witness should be installed onto a server separate from the SvSAN VSA. SvSAN works with any x86 server that exists on the VMware vSphere ESXi or Microsoft Hyper-V Hardware Compatibility List (HCL). Furthermore, SvSAN will work with any supported internal server disk storage or JBOD array. SvSAN supports the industry leading hypervisors, VMware vSphere and Microsoft Hyper-V. It is installed as a Virtual Storage Appliance (VSA) requiring minimal server resources to provide the shared storage necessary to enable the advanced hypervisor features. If VMware vSphere is chosen as the hypervisor to deploy with SvSAN, StorMagic recommends vSphere Essentials Plus as a minimum to enable high availability. SvSAN Maintenance & Support provides organizations with access to StorMagic support resources, including product updates, knowledgebase access, live-chat and email support with our technical support staff. 1Gold Support is only available within the timezones of UTC -08:00 to UTC +02:00. If you fall outside of this range, you must purchase Platinum Support. More information on SvSAN Maintenance & Support can be found at stormagic.com/resources/support.